For over a decade Career Directors International (CDI) has been recognized as the industry leader for professional resume writer training and certification in both generalist and specialist categories. 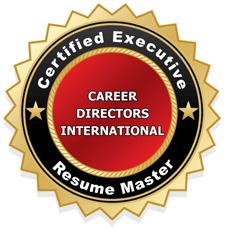 Now, recognizing a critical and growing need, CDI has launched their newest designation, the Certified Executive Resume Master, to help job seekers identify the best of the best for their executive resume writing needs. CDI is proud to make it their mission to help resume writers to elevate their profiles and strive for the highest level of excellence in their craft with credentials like the Certified Executive Resume Master. Career Directors International (CDI), a global association of resume writers and career coaches, takes the profession of resume writing very seriously. The Certified Executive Resume Master (CERM), which is the newest credential to be added to their list of designations, is designed to create standards and regulatory processes in a critical yet unregulated industry. To that end, CDI’s resume certifications all require successful candidates to possess impeccable qualifications in job seeker marketing. They must be up-to-date in leveraging personal branding, positioning, strategizing, key word optimization, and high-level formatting in their resumes. Certified Resume Specialist + X (CRS+X) – a qualification that can be earned in one of 15 different specialties from Finance to IT. The new Certified Executive Resume Master (CERM) credential is designed specifically for professional resume writers who excel at writing resumes for executives, and who want to position themselves to best serve this market. The CERM will assure global executives at all levels that their resume writer is highly skilled in the tools of the trade and has earned CDI’s seal of approval. The CERM takes a hybrid approach to CDI’s other high-level certification processes by not only requiring a portfolio of executive resume samples but also necessitating the completion of an online executive competency review. This review tests general knowledge of executive resume writing and requires on-the-fly writing to demonstrate skill in editing and constructing content that is concise, results focused, and which indicates understanding of the situation posed. CDI is proud to make it their mission to help resume writers to elevate their profiles and strive for the highest level of excellence in their craft. Certifications like the CERM are complemented by a vast array of resources and tools coupled with a broad network of industry leaders in both resume writing and career services/coaching. Industry professionals can learn more about the CERM credential and the special introductory offer, which ends Friday, at http://www.careerdirectors.com/cert_cerm.htm. Information on all of CDI's certifications can be found at http://www.careerdirectors.com/cert.htm.